Purple Films co-founders Dan Gillespie and Jimmy Gall have been making films since before they could drive a car. The pair met as 12-year-old students at Brecksville-Broadview Heights Middle School. Gillespie liked snowboarding, Gall liked BMX — but they both loved working with video cameras. By the time the pair graduated from high school in 2006, they had made their first video together — a short presentation for English class. They didn’t know it at the time, but they were building a working relationship that would carry them to the top tiers of the Cleveland filmmaking and video production industry. After high school, Gillespie saw an article in The Plain Dealer about the Media Arts and Filmmaking program at Cuyahoga Community College. Eventually, he and Gall both enrolled at Tri-C. Gillespie graduated in 2010 with a certificate in digital video editing, while Gall graduated in 2011 with an associate degree in digital video and filmmaking. During their time at Tri-C, Gillespie and Gall worked on various projects for the College. Their Tri-C experience paved the way for them to find work after graduation, producing music videos for local artists. But it’s turned into much more. Seven years later, Purple Films has become one of the leading video production companies in Northeast Ohio. 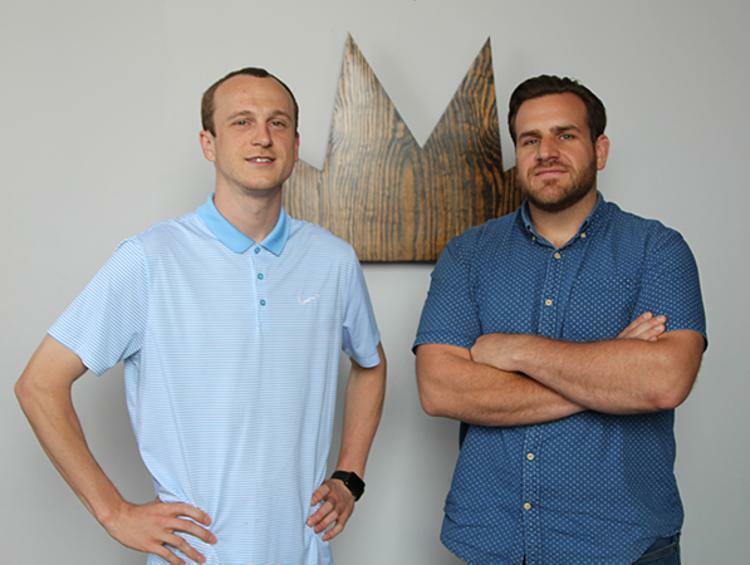 Gillespie and Gall have worked on projects featuring area sports stars such as the Indians’ Francisco Lindor and former Cavalier LeBron James. This spring, the pair won a regional Emmy for a video that aired on WKYC Channel 3. “The stories we tell are about people — things that are going to connect with viewers on an emotional level,” Gall said. There is nothing at the corner of E. 20th St. and Hamilton Avenue to point you in the direction of Purple Films’ home office. It’s located in a low-rise gray brick building, similar to the other buildings in its light industrial neighborhood just east of downtown Cleveland. But behind those gray walls, Gillespie and Gall have made a lot of video magic happen. Their main studio is essentially a large garage. But it’s perfect for their needs — a massive space with high ceilings that can be easily converted into different sets, depending on the shoot. In April, the pair had less than an hour with the Tribe’s Lindor. They had to film a segment for Champs Sports called “Going Numb.” In the segment, Lindor and another contestant had to answer trivia questions while sitting in tubs of ice water. This is the pair’s second stint in the studio. They originally worked as photography assistants for some of the photographers who have used the space. After moving Purple Films to another nearby location for four years, they returned to Hamilton Avenue in 2016. “The photographers we worked with were great mentors for us in the early days, just showing us how to run a business day-to-day,” Gillespie said. Gillespie and Gall do plenty of work in their studio space, but some of their favorite projects take them into the community and around the country. The pair have taken crews to locations as far away as Texas, New York, Florida and Arizona. Some of their best work, however, has highlighted the stories of everyday people in their own backyard. Purple Films teamed with WKYC Channel 3 on a series of short segments titled “Rising,” which looks at local residents persevering in the face of extraordinary circumstances. Their Emmy-winning video came from the “Rising” series. It featured the story of Malieke Graham, a Garfield Heights teen with cerebral palsy who had the opportunity to play in a varsity basketball game for Garfield Heights High School. For young filmmakers still working to build a reputation in Cleveland and beyond, winning an Emmy was more than a professional accolade. It was a statement about how far they’ve come as a team, and how far they intend to go.